My name is Peter Kraker. I am the founder and chairman of Open Knowledge Maps, a charitable non-profit dedicated to improving the visibility of scientific knowledge for science and society alike. As part of our mission, we create a visual interface to the world’s scientific knowledge that enables a diverse set of stakeholders to openly explore, discover and make use of scientific content. 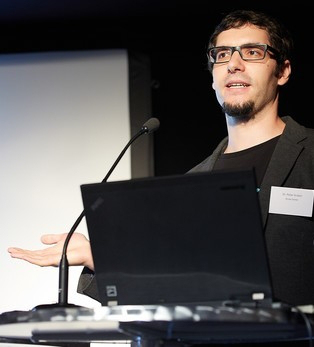 I am a long-time open science advocate – I am the coordinator of the GO FAIR Implementation Network “Discovery” and member of the core team of the Open Science Network Austria. I coined the term “Open Methodology”, one of the core principles of open science, in the 2011 paper The case for an open science in technology enhanced learning with D. Leony, W. Reinhardt and G. Beham. I am the lead author of The Vienna Principles, a widely acclaimed vision for scholarly communication in the 21st century. I was a senior researcher in the Social Computing group at Know-Center (Graz University of Technology), managing the topic of Open Science. In my research, I focused on visualizing scholarly communication on the web, open science, and alternative metrics for science and research (altmetrics). You can find a list of my publications and research outputs here, and slides to a number of selected talks here. I received my doctoral degree (Dr. rer. soc. oec.) from University of Graz in 2014. I have worked in a number of EU-funded projects studying online scholarly communication, including the Network of Excellence STELLAR, the Marie Curie project TEAM, and most recently I lead the work package on innovative dissemination in the Horizon 2020 project OpenUP. For my work, I was awarded a Panton Fellowship of the Open Knowledge Foundation and a Marshallplan Scholarship of the Austrian Marshallplan Foundation, which I spent at the Personalized Adaptive Web Systems Lab of University of Pittsburgh. For my dissertation, I have received the GOR Thesis Award 2016 and the GRAWE Promotional Award 2014. I serve as a reviewer on several editorial boards and program committees (among others the open access journals Data, Research Ideas and Outcomes (RiO), Frontiers in Library and Information Science). Between 2016 and 2018, I was a mentor for the Open Science Fellows program of Wikimedia Germany. From 2015 to 2018, I was a community coordinator of the Open Science Working Group of Open Knowledge Austria. From 2011-2013, I acted as chairman of the Knowledge Management Forum in Graz. I have also been involved in the organization of the Science 2.0 & Open Science Track at i-KNOW, as well as several editions of Barcamp Graz, and the JTEL Summer School. If you want to contact me directly, please send an e-mail to pkraker (at) openknowledgemaps (dot) org.